Tip #167: Hang up your swimsuits. Whether you’ve got yourself regular dates with a city splash pad or a shady backyard and a hose, the result is relief from the heat and an assortment of soaked swimsuits* to contend with after the fact. 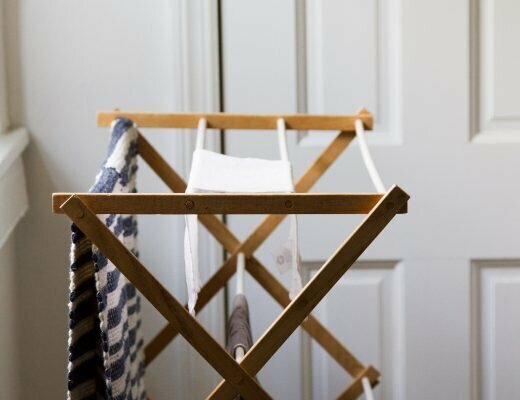 Enter our latest solution and a bit of encouragement to get your drying rack off the ground. I’ve been debating the addition of a wall-mounted rack for well over a year at this point and I’m so glad I took the plunge. In our apartment it’s freed up precious floor space and it’s stopped our drying rack from being turned into an ever-buckling fort on the daily. I found our drying rack—a vintage swing-arm towel rack—on Etsy and painted it in the same shade of gray that I used on Faye and Silas’s new dresser. **) Hung up on the back of our open closet wall, it’s discreet and useful and dare I say, pleasant to look at. (We like it so much, we actually decided to remove the curtain we’d had hanging in the space before.) The rack is vintage and handmade in a style similar to the rack that I’ve long admired from Iris Hantverk, but it was far less expensive and it arrived in just a few days. There’s nothing exactly like the one I found listed right this minute, but it’s worth a regular look on Etsy or Ebay to see what vintage goodies might appear. Try searching “swing-arm towel rack,” “wall-mounted drying rack,” or a similar combination and see what you find! It’s perhaps worth a note that lots of small-space dwellers might get by without a drying rack at all. (Alternatives in this post!) In our family we’re fairly religious about hang-drying clothes in an effort to extend their life and as folks who have put two kiddos through cloth diapers, there’s a regular need for hanging up diaper covers to dry. I love having a dedicated drying spot to keep things tidy. 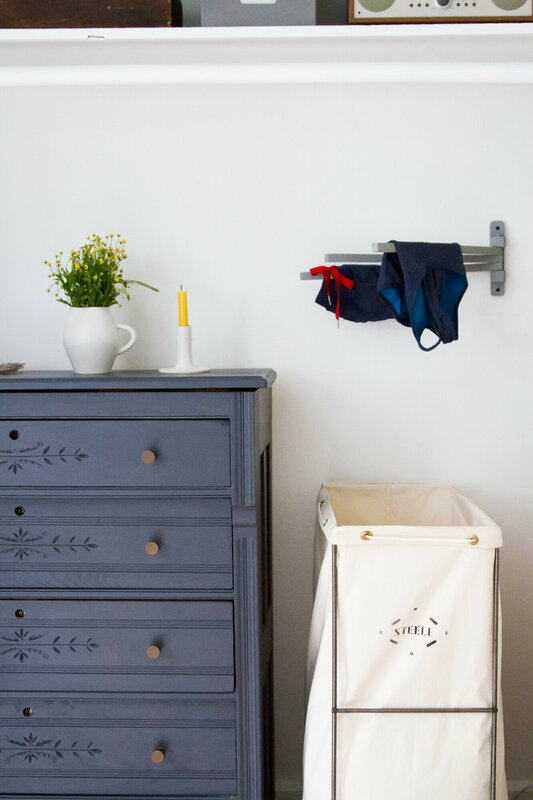 To that end, we haven’t given up on our floor drying rack altogether—it still gets pulled out once weekly when our laundry comes back from the laundromat—but for rinsed rags, hand-washed items, and bathing suits that need daily drying, we’re new devotees of this wall-mounted solution. What about you guys? 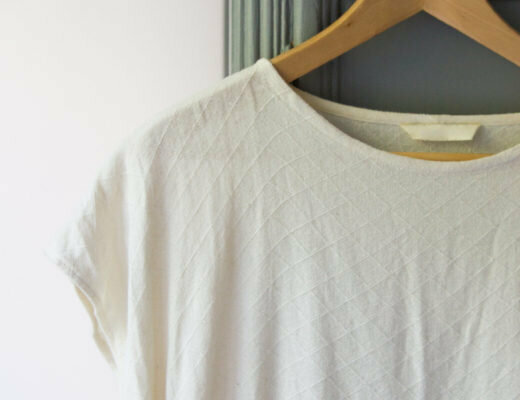 Any other favorite clothes drying solutions out there? *Misha & Puff sent Faye and Silas their new summer suits, pictured above. We pair them with their City Threads Rash Guards for full sun protection. 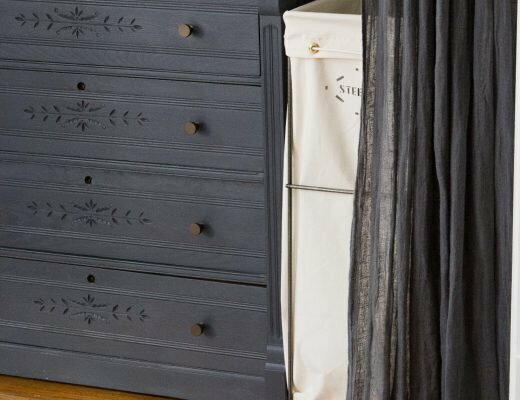 **The rack is painted with Plummet from Farrow & Ball. Farrow & Ball generously provided the paint for our dresser project in the kids’ room—more to come on that front—and I’ve been busy putting the remainder of the can to good use! Tiny apartment survival tips #1-166. Almost ashamed to say i was very excited about this post! I’ve been eying wall mounted racks for forever but am afraid of worrying through our ancient and poorly replastered walls. Extra floor space, though. I also hang dry all but the towels and sheets, and when I’m too lazy about the laundromat we end up with two drying racks loaded from top to bottom. The only thing that saves floorspace here is to do laundry more often. But one of my friends who lives in Ireland grew up with their laundry stretched in a line and a rack that came down from the ceiling over the staircase. I thought that was creative at the time; I’ve always wished it were still legal to stretch the lines from window to window like photos of old NYC, but thinking twice I’m sure the laundry would be filthier once dry that it was before the laundromat. I know it. We used anchors, for sure! Great idea! I also live in a tiny apartment and my spouse and I hang our swimsuits in the bathroom. We hung two small sticky hooks on the tile at the back of our tub. They aren’t the prettiest things, but they get the job done! I’m a huge fan of wringing out the wet items really well (swimsuits, towels, shirts I don’t dry, underwear and socks when I’m tight on money and wanna reduce how much I dry) and hanging them on the tops of doors. Open the door and drape the laundry right over. This results in my house being coated in little bits of laundry every where, and it mildly drives my girlfriend nuts, but it gets the job done! Ha! Definitely siding with your girlfriend on this one! Do you machine dry anything at all? And does it really make a difference in extending life of most clothes? I do this for many items, but definitely not t-shirts and such, but maybe I should? Also, have you tried the Ikea folding rack? I’ve been eyeing it. Love the wall-mounted one! And the grey! Yes, we machine dry lots. We only do laundry once a week so we’d have way too much to dry all at once if we tried to hang dry everything! But we try to hang dry as much as we can and definitely feel like it helps clothes last longer. Haven’t tried the Ikea rack! I’m a huge fan of Farrow and Ball !! Excited to see a colaboration between you two, it’s an amazing brand and also more available to your European readers than Benjamin Moore! Drying racks the way to dry our newspapers that the delivery person delights in tossing in puddles or on top of the sprinklers. If that’s your lot, too, the OXO rack is the right size to hold an open sheet and has enough lines to dry both our papers. We hang dry all of our clothes in our small home – an 800sqft 1920’s bungalow. A few years ago we splurged and purchased a Shelia Maid and we haven’t looked back since. I love the way it looks and the way it functions: no floor space needed, no wall space needed, everything is up out of the way in our tiny hallway. It looks clean and simple. Every friend that sees it in our home marvels at it. It works so gosh darn well! Glad you found a solution that works for you! So glad! Love those Sheila Maids! We are two adults and one almost-adult in an apartment, and we have a closet washer/dryer in the unit (noisy but handy). My daughter and I both have clothes that shouldn’t go in the dryer, and some that I handwash as well. We have one stand-up rack and one over-tub rack; they both fold flat and can be squeezed into the space beside the washing machine. If shirts or dresses aren’t dripping, I’ll hang them on hangers over the shower bar. I hang damp jeans over chairs (hide them if company comes). I sometimes put the stand-up rack right into the bathtub, if the clothes are really wet. I also just bought a peg-less travel clothesline with hooks and suction cups, but I haven’t yet figured out how best to use it in our space. I put an adjustable shower curtain rod above the middle of my shower/tub. After hand washing swimsuits, bras and delicates, I put them on hangers on the rod to dry. Any drips go down the drain. I store the rod when I am not using it. P.S. Those are nice looking undecorated rash guards you found- we love long sleeves for sun protection. Where did you get the white pitcher holding the yellow flowers? It is beautiful! Thanks! It’s from Notary Ceramics!